JewishWorldReview.com | Ratatouille, that Mediterranean melange of sweet peppers, tomatoes, zucchini and eggplant, is a perfect goodbye to summer dish. You'll notice in the markets that peppers, tomatoes and zucchini are usually at their prime toward the end of September. I often make up a batch of this as the days get shorter to cheer myself up. This colorful vegetable casserole, with its lusty, Provencal flavors, can be prepared in a number of different ways. Traditionally, each vegetable is sauteed in olive oil separately and then all the vegetables are added together at the end of the cooking. This can make for one very oily dish. Many of the vegetables tend to get saturated with the oil. In this baked rendition, the vegetables are roasted in stages, using much less oil. All the traditional flavors are included with a lighter finish. Adding the pesto at the end brings all the flavors together. If you make this pesto, you can use any remaining pesto on vegetables, pasta or as a sauce for chicken. If you don't have the time, just pick your favorite store-bought variety. 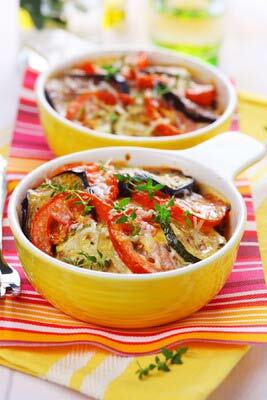 Ratatouille can be served as a side dish with any grilled fish, chicken or meat. I love to serve it a chilled salad. (You can jazz it up by adding some capers and black olives, if you like.) It is also excellent as a filling in omelets and crepes. Once you make this and try it, you'll probably come up with your own favorite way to serve it. Let me know if you have any new favorite ideas. Enjoy. 1. Preheat an oven to 425 F. In a large roasting pan, place the eggplant, onion, peppers and thyme. Drizzle with the olive oil and toss to coat well. Roast for 20 to 25 minutes or until the vegetables are beginning to soften, stirring halfway through. 2. Add the mushrooms, garlic, crushed tomatoes, and salt and pepper to the pan, and toss to mix well. Return to the oven and roast for a further 10 to15 minutes, or until the tomatoes have started to break down, stirring halfway through. 3. Add the zucchini, parsley and basil to the pan, toss, and return to the oven for a further 8 to10 minutes, or until the zucchini is tender. Remove from the oven and taste for seasoning. 4. Using a slotted spoon, transfer the mixture to a heated serving dish or platter, leaving the excess liquid behind. Stir in the mixed herb pesto, garnish with a few whole basil leaves, and serve immediately. 1. Add the garlic cloves to a food processor and process until finely minced. 2. Add the basil, parsley, scallions, rosemary and thyme, and process until pureed. 3. With the motor running, slowly pour in the olive oil in a fine stream. Scrape down the sides of the bowl to blend the ingredients. Add the salt, pepper and cheese, and process just until well blended. Taste for seasoning. Refrigerate the pesto in a tightly covered container until ready to use. © 2013, Diane Rossen Worthington. Distributed by Tribune Media Services Inc.